Is a Titan-like planet with Earth-like gravity plausible? For my hard sci-fi story, I would like to have a planet similar to Titan (very cold, nitrogen atmosphere, methane seas) but with a surface gravity in the region of 1g. Could this occur, or would the greater gravity result in a significantly different atmosphere? 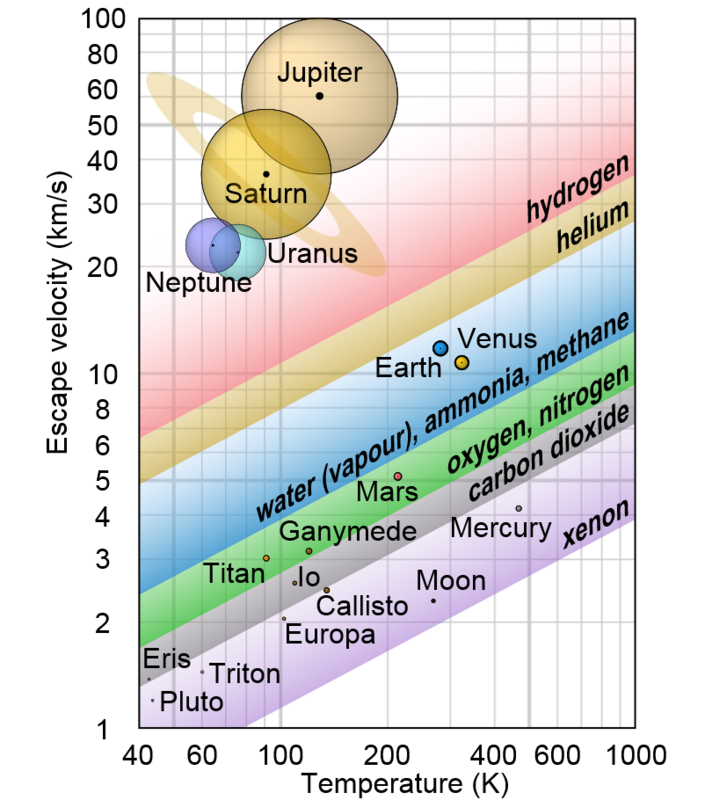 with Earth escape velocity and Titan temperature your planet should be able to keep nitrogen and methane, like you ask, but also water, ammonia, oxygen, helium, carbon dioxide and xenon. Hydrogen might be borderline. If you don't have photosynthetic life forms it is likely that all the oxygen will be chemically bound to other atoms, due to its reactivity, and you will have no free oxygen. That depends on if the planet is sole or a satellite of a giant planet. For simple stuffs: by second cosmic velocity from one side and temperature and molecule weight from the other. For complex stuffs: by second cosmic velocity from one side and temperature, atomic weight of the lightest component of the molecule and the radiation level in the exosphere from the other. For both variants the speed of input of the stuff into the atmosphere is utterly important, too. for simple stuffs: The speeds of molecules is distributed statistically. (https://www.khanacademy.org/science/physics/thermodynamics/temp-kinetic-theory-ideal-gas-law/a/what-is-the-maxwell-boltzmann-distribution) There are always some fraction that have velocities above the second cosmic. And that fraction, in higher heights will be dissipated into space. That defines the speed of output of the stuff. The speed of input and output are balanced. For complex stuffs: The radiation makes molecules fell apart. And if they can, they are joining back. That can be prevented by the loss of a component. For example, water is divided into hydrogen and oxygen. The first is lighter and has much higher speeds of molecules. And speed of losing water is defined by the fraction of hydrogen in water vapor (defined by radiation) and fraction of hydrogen molecules, free atoms or ions, having second cosmic speed (defined by temperature). The speed of oxygen is 256 times smaller (gases have same temperature/energy and H2 is 16 times lighter than O2, so lesser mass should be compensated by 16^2 times higher speed), so its losses are negligible in comparison and it is always enough oxygen to restore the water molecule back. Again, the speed of coming and losing the stuff are balanced. 1. It is not acceleration that is important for gas keeping in the atmosphere, but the second cosmic speed. For example Saturn has same acceleration as the Earth, but much higher second cosmic (35m/s2), and does not lose even hydrogen. The question is undefined in this part. Let us say, you need a planet that is more Earth-like and the second cosmic is the same as ours (11m/s2). Titan on its place does not lose nitrogen. Neither would the Earth there. The water is frozen and lies as rock. The same would be on the Earth. Titan has some methane as liquid. Not much, for it escapes by radiation dissipation and hydrogen losing. The Earth would lose less hydrogen, so, much more methane will be left. Seas will be larger. At its place, the Earth significantly loses only hydrogen and helium. The question is, what will be with them if the Earth will have the Titan temperature. For much H in atmosphere will cause reaction with N and ammonia will snow onto the surface, leaving no N in gas state. (https://geosci.uchicago.edu/~kite/doc/Catling2009.pdf) - look for explanation below the chart on the 4th page. 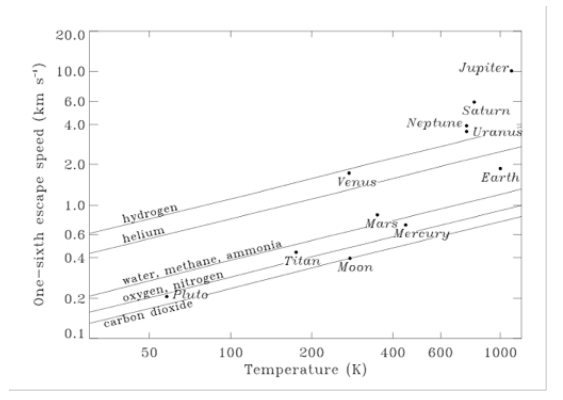 According to the chart, if the planet will have the radiation and temperature as on Titan and second cosmic speed as on the Earth, the planet will NOT lose its hydrogen and as a result, it will have ammonia/hydrogen/helium atmosphere instead of the nitrogen one. Ammonia fells as snow and only H/He atmosphere remains. It will be so, if the planet will be separate one. But if it will be the satellite of a giant, the giant and Earth magnetospheres will react, thus greatly heating up the exosphere layers (look at the Earth and giant planets temperatures on the chart). And it WILL lose its hydrogen and helium and mainly nitrogen remains. Not the answer you're looking for? Browse other questions tagged planets hard-science or ask your own question. What would a world with uneven gravity look like? What would the air on a planet look like if it had a mostly methane atmosphere? How can my Titan-like cryoplanet have clear skies? How much variation is possible among planets with “Earth-like” surface gravity? What's the biggest reasonable natural planet or moon with Earth-like surface gravity? Planet Titan, could this work? Fire Hazard of Human Domed Cities on Planet with Methane CO2 Atmosphere?